It doesn't matter what kind of gundog you are training, one of the most important functions of a shooting man's dog is to find game for him to shoot. With that in mind, we want a dog that will hunt the cover for live game, produce it within shooting distance, and be steady to the flush. Steadiness to flush is essential for safety, especially if the flush is a rabbit. No one wants their dog to get in the way of an ounce of lead. Of course, no matter what is flushed you may miss and a dog running out of control can easily disturb other game that you could have had a shot at later. "But, if you work into the wind, the dog tends to keep closer and develops a more even pattern." Retrievers, as well as spaniels and the HPR breeds, can be used for hunting up game. 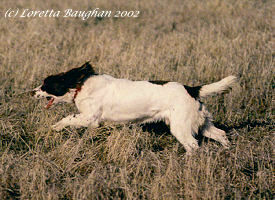 Many rough shooters, whom I have known, preferred one - as it tends to be a little slower than a spaniel. Of course, hunting up is not always just for unshot game. A high percentage of the time, when picking up on shoots, a dog handler does not know exactly where game has fallen and has to sweep up when the drive and shooting is over. Even when I have been duck shooting on flight ponds in the early evening, I have waited until the flight is over before going out and sweeping the ground with either my Spaniel or Labrador to find the birds. Whether it is finding unshot or shot game, the most effective way of doing this is to have a dog that works a good pattern and, using the wind correctly, misses no ground in his search. So how do we get a gundog to work and quarter the ground correctly with efficiency? Initially, with a young dog, you have to encourage him to run around in front of you in shortish cover, working a zig-zag pattern across and into the wind. Although we need to take wind direction into account when quartering, it is difficult to teach a dog to do this. Some dogs do it naturally; others never seem to get the idea. But, if you work into the wind, the dog tends to keep closer and develops a more even pattern. Work in short cover and definitely nowhere that you can lose sight of your dog because you always want to keep in touch. The secret is not to walk too fast forward, but to take a very flat zig-zag pattern, at first.